(NaturalNews) From time to time over the past decade or so, a particular type of viral infection known as West Nile Virus (WNV) has made the news since it made its way into America in 1999. Mosquitoes are the carriers, from the infected birds they first bite, to the animals and humans they bite later. Most birds are vectors, or carriers that don't get ill or die from the virus, except for crows. They are so easily, adversely affected from the virus that dead crows in a given area are used as early warning signals for WNV spreading to mammals. Up to 80% of infected humans are asymptomatic. They do not exhibit flu-like symptoms. Unless they are bitten by mosquitoes that will in turn bite others, there is little or no chance of spreading their infection to others. Touching or kissing does not infect others. Blood transfusions, transplant organs, and breast fed milk from infected human hosts are considered rare infectious possibilities. Apparently, it's a blood borne disease. It takes three to fourteen days for symptoms to show after being bitten by an infected mosquito. Even the remaining 20% who do show common flu-like symptoms are unlikely to infect others. So far, no big deal. What's the fuss? There is the one percent who may develop serious neurological disease variations of encephalitis (brain inflammation) that can lead to death. But just like the HIV virus, some dispute that the WNV virus has been isolated or even exists. That challenge will be presented later in this article. Assuming that WNV actually is real and infects humans and animals, consider garlic, because so far no pharmaceutical solutions exist. And that's a good thing. 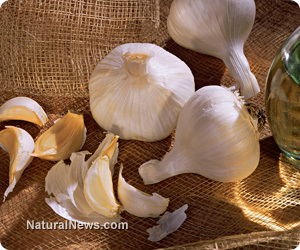 Garlic actually repels mosquitoes, but not from garlic breath. If you have a high allicin (garlic's active anti-microbial ingredient) blood count, mosquitoes will refuse to engage with your blood. If you are infected, garlic can eliminate the virus because it is a proven anti-microbial, killing both viruses and bacteria. According to the good people of zhealthinfo.com, a friend of theirs had lost a couple of horses to WNV. Several of his other horses and a dog were ill from the same infection, so he injected them all with garlic essential oil. They all recovered rapidly. Injecting garlic oil may not be tolerated well by humans though. But eating several cloves daily and rubbing garlic oil on the bottom of your feet, supported with olive oil, is considered very effective against many viral infections. In order to release garlic's healing properties, it should be crushed and then eaten. Chewing it well before swallowing is also beneficial. Some would rather take allicin supplements. Then, efficacy depends on the supplement's quality. For the most part, garlic is garlic, and it's more cost effective. According to investigative reporter Jon Rappoport and others, the WNV microbe has not been isolated. The filtering process was faulty, and that means the virus may not have been trapped in it. Rappoport cites Robert McLean, director of the National Wildlife Center of the US Geological Survey, who told ABC's Nick Regush, "We don't have a purified form of the [West Nile] virus." Any detection of WNV infection involves antibody or cross testing. Cross testing is also used for suspected HIV, hepatitis C, and others. There have been many HIV positive test results that were false. One researcher claims there are 60 other reasons one could test HIV positive. These are a few viral testing situations that often put folks into dangerous pharmaceutical treatment modalities unnecessarily. When they die from the treatment, it can be reported that the virus killed them, thus padding the death toll from the disease to create more fear and desperation. Play it safe with garlic.